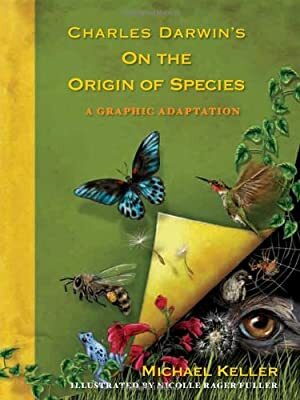 Summary: This book is – for the most part – exactly what it says in the title: Darwin’s On the Origin of Species presented as a graphic novel. The bulk of the book provides quotes from Darwin (maintained in the same chapter structure as Origin) over drawings of examples that illustrate his points. There is also a first section, that gives a brief biographical sketch of how Darwin came to formulate his theory of evolution by natural selection, and an epilogue that gives a quick overview of the advances in evolutionary theory since Darwin’s time. Review: Darwin’s name gets tossed about pretty willy-nilly these days, but relatively few of the people doing so have actually read On the Origin of Species. (Which is in itself a shame, if for no other reason than because it’s a beautifully constructed and very convincing logical argument.) I applaud Keller and Fuller’s effort to make this highly influential and foundational work more accessible to a broader audience. For the most part, it succeeds very well; having illustrated examples helps to break up Darwin’s admittedly somewhat dense Victorian prose, and to clarify the points he’s trying to make. But I think where this book really succeeds is by letting Darwin speak for himself, for keeping it as an adaptation of Origin rather than making it a modern primer to evolutionary biology. In fact, the places where I had the most problems with this work were where they deviated the most from the book they were adapting. I understand why they chose the examples that they did, but I still had a moment of cognitive dissonance every time they paired Darwin’s words with an example that wasn’t discovered until long after Darwin’s time. Also, every time they tried to paraphrase or invent Darwin’s words, rather than excerpting them, the result came off as jarringly modern and distracting. The worst example of this was the last page of the epilogue: they included in full Darwin’s quote about “There is grandeur in this view of life” at the end of the section that’s adapting Origin, but then paraphrased it again at the very end of the book, completely killing all of that line’s poetry in the process. But for the most part, they get it right, and in doing so fill an important hole in the popular scientific bibliography. 4 out of 5 stars. Recommendation: While I suppose we can’t require that every public figure and policy maker who wants to talk about evolution first read Origin, perhaps we could require them all to read the graphic novel version? Probably not, alas. Still, it’s recommended for anyone who wants to get a handle on what Darwin actually had to say but is gun-shy about diving headlong into his books. Thanks for this review and the link. You’ve made me remember that I wanted to find a used copy of this one to add to my graphic novel shelf! Gavin – I don’t own many graphic novels, but this one is definitely one for which I’d like my own copy. It sounds like this book is well done – I need to look into it. Kathy – It really is, and I appreciate how well it’s geared towards laypeople, even though it uses mostly Darwin’s original words. Emily – Hooray for more science in the libraries! Maybe the graphic novel format will let it accidentally sneak into the reading life of someone who wouldn’t go near the actual Origin book with a ten-foot pole.